Wash the spinach (see washing tips below), but don't dry it completely. The water that clings to the leaves will steam the spinach as it cooks. Heat the olive oil in a wide, heavy skillet over medium heat. Whack the garlic cloves with the side of a knife and toss them into the oil. Cook, shaking the pan, until golden, about 2 minutes. Scatter the spinach a large handful at a time into the pan, waiting until each batch wilts before adding another. Season lightly with salt and pepper and cover the pan. Cook until the spinach begins to release its liquid. 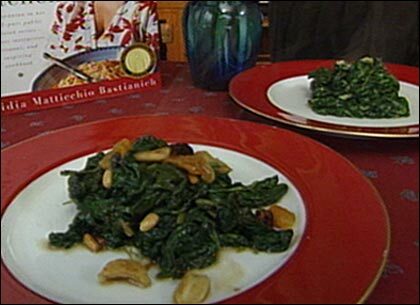 Uncover the pan and cook, stirring, until the spinach is wilted and its water has evaporated, 1 to 3 minutes. Taste, and season with additional salt and pepper if you like. Serve hot. Adding a small amount of dry breadcrumbs to the pan near the end of cooking is a traditional Istrian way to prepare spinach. 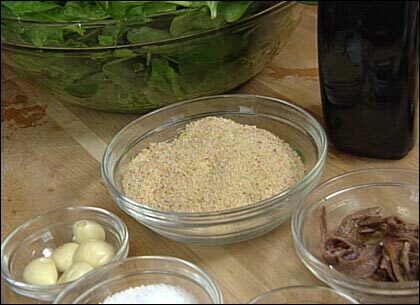 Bread crumbs not only add flavor but also absorb some of the liquid that the spinach gives off, making the spinach neater if you're putting it on the same plate. Prepare the sautéed spinach as described above, sprinkling 2 to 3 tablespoons of fine, dry bread crumbs over it just before removing it from the heat. Clean and wash the spinach (see washing tips below). Toast the pine nuts. Chop the dried fruit and soak it in the balsamic vinegar. Heat the olive oil in a sauté pan and cook the spinach until it is wilted, making sure to drain any excess liquid. 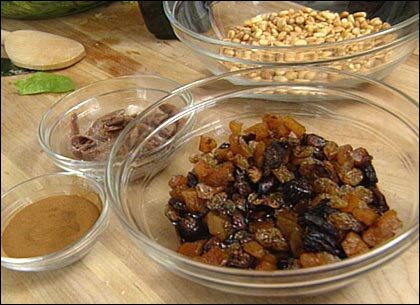 Add the anchovies, dried fruit or raisins, and pine nuts. Toss well and season with salt, pepper, and a sprinkle of cinnamon. Mix well and serve. If you like, leave the stems on tender, young, or flat-leaf spinach, but remove the stems from tougher, thick, curly spinach leaves. Wash the leaves in a sinkful of cold water, swishing them around to remove the sand and grit, then letting them float a minute or two to give the dirt a chance to settle to the bottom of the sink. Lift the leaves from the sink with your hands or a large wire skimmer into a colander to drain. Two 10-ounce cellophane bags of spinach, or three large bunches of leaf spinach, will yield about 1 pound spinach leaves when cleaned. This segment appears in show #2805.